A number of events in December have been cancelled due to the poor weather and the very bad ice on the pavements in Elgin Street. These include the Christmas Parties for the Guild and Get-Together. Please check the calendar to ensure that an event is still planned to be held. Christmas Cards featuring Bennochy Parish Church are on sale in the Methven Hall after Sunday services, price 50p. Would you like to send Christmas greetings to friends in the Church and at the same time help Maggie's Centre and save on cards? If so, see the large 'Message' poster in the New Hall. The Flower List for 2011 is now available in the vestibule. If you wish to provide flowers for the Sanctuary, please add your name to the Sunday(s) of your choice. The Vacancy Nominating Committee have announced that they have selected Rev. Robin McAlpine as their sole nominee. Robin is currently the Development Officer for The Church of Scotland and lives in Kirkcaldy. He has previously led services at Bennochy Parish Church during the last year. Please join Robin for morning worship on Sunday 16th January. The November newsletter has been distributed to congregation members and is also available on the Newsletters page. The football shirts sent via our Missionary Partner to Zambia have now arrived and a selection of pictures of their reception can be viewed by clicking here. The Kirk Session are considering the possibility of including some stained glass in the main windows of the sanctuary to depict the union of St. Andrew's and St. John's. On Wednesday 24th November at 7pm, Shona McInnes will give a presentation of her work. Anyone interested is very welcome to attend. Order for 2011 are due this week. Regular subscribers will be automatically registered. Other member of the congregation may be interested in this monthly magazine, independent in its views, with new from home, abroad, study, prayer, correspondence, parish profiles and more. If so, please contact Margaret Simpson. The Clown and Jester rag dolls which were for sale on the craft stall at the Christmas Fayre were made by Dorothy Sillett. She intends to go on making them, with the proceeds going to the The Children's Hospice, Kinross. Phone Dorothy on 561146 for further information. On Sundays 5th, 12th and 19th December we would like to decorate the Church with poinsettias. If you would like to purchase one in memory of a loved one or friend, please put your name and the person you wish to remember on the list in the vestibule. The names will be included in the Order of Service and the cost is £5. After the service on 19th December or on Christmas Eve, please collect your plant and take it away. The final date for purchase is 2nd December. Any questions, please contact Senga Booth on 890972. Copies of Pray Now 2011 can be ordered at a discounted price of £4 per copy. Order forms are available in the vestibule and in the Methven Hall after services. Orders must be made by 21st November to qualify for the discount. If you are unable to access the order forms please contact Lilian Haig on 264719. The Walkers next walk is on 21st November when Bob Docherty will lead a history tour of Burntisland, including a visit to Burntisland Parish Church. This tour will leave the Church at 12.30pm and car-share. The tour is approx 4 miles walking with a 46 step climb! All welcome. The first Bennochy Parish Church Christmas Fayre was a great success with a wide selection of items for sale. Santa also helped out by opening the Fayre and meeting the children. So far £2,840 has been raised. You can view some pictures from the Fayre by clicking here. Our Service of Remembrance on 14th November will start at 10:50am. There will be a special offering for Poppyscotland. Last year's Scottish Poppy Appeal broke the 2008 record by raising £2.2 million to help serving personnel, veterans and their families wherever they live in Scotland. Your support to this worthy cause will be greatly appreciated. The Christmas Fayre is on Saturday 13th November from 2pm. Tea tickets will be available every Sunday in the Methven Hall priced £2. In addition we also need volunteers to serve Teas, Coffees etc. Please contact Margot Stenhouse or Jane Drummond if you are able to help out. The Gift Day is on Saturday 23rd October from 10am till 1pm when you can come along to the Methven Hall with your donation and enjoy refreshments. If you are unable to be there, please put your donation in an envelope marked "Gift Day" in the collection when next at Church or hand it to your district elder. The filled shoe boxes are being uplifted from the Church on Thursday 11th November and taken to Templehall Church which is the pick up point for the Kirkcaldy area. The boxes will then be loaded onto a collection truck for the start of their journey overseas. Please bring your filled show box to Church on Sunday 7th November, or the 31st October if not suitable. Please remember to include a suggested donation of £2 to cover transport and administration and place this in an envelope inside the box but on top of your gifts. You may wish to use an envelope of your own or use the attached envelope on the brochure. To read more information please visit the Blythswood Care Shoe Box Appeal pages. The Walkers next walk is on Sunday 10th October, leaving a little later than usual at 1.00pm, we'll do a 5 mile walk through Kinnesswood and Scotlandwell to Lochend Farm and return. This is definitely a walk on the wild side encountering steep stairs, a bit of a climb at the foot of the Bishop and walking through a freshly harvested field. The last of the summer walks perhaps, with magnificent views over Loch Leven and beyond. All are welcome. Sunday 3rd October is Harvest Thanksgiving Service. Gifts of tinned and non perishable foods (packets, pasta etc) will be gratefully received which will go to the Salvation Army for distribution. The special offering for the Pakistan Floods Appeal amounted to £337.40. Thanks to everyone who supported this worthwhile appeal. An offering in aid of KART (Kirkcaldy Area Reachout Trust) raised £111.90. Sponsored Half-marathon and Glasgow to Edinburgh Cycle Ride raised over £650 for Bowel Cancer. Family Quiz Night (Women's Group) raised £302. Many thanks to all those who helped and to all those who support Christian Aid in any way. Christian Aid and its partners are working to bring an end of poverty around the world. We are awaiting confirmation of delivery of 3 parcels to Jenny Featherstone last weekend: strips and shorts for the Junior Team, as detailed in the August newsletter. They went out to Zambia as personal luggage of Mrs. Chenimbiri, saving us the postage. Money saved is being sent direct to Jenny's bank account for her projects - this goes through the Church of Scotland and is designated for Football boots for the team. There has been no rain since April and the ground is like concrete - just imagine! They play well, but what a difference it will make! Jenny is thrilled with our contribution and despite having her camera stolen again will send photos of the team in full kit. The September newsletter has been distributed to congregation members and is also available on the Newsletters page. We have received a letter from the KART treasurer, Maureen Latto - "On behalf of KART we wish to thank your congregation for the donation of £111.90. This is very much appreciated. Not only do we welcome your financial support, we ask that you continue to pray for KART and especially for Chris Beattie, our worker, as he takes God's word to our young ones." Associated with 'Back to Church Sunday' on the 26th September you can now visit a special website. Click here to enter the site. Invitation Cards, which you can give to friends and neighbours you feel may be interested in coming to Church with you on this Sunday (or any Sunday), are available in the vestibule and halls. The Women's Group are holding a family quiz night on Saturday 25th September at 6.30pm. Tickets, adults £4, children £2, can be bought from members of the group. Bring along a team of 4 persons to the Methven Hall and enjoy an evening suitable for all the family. The sponsored walk around the Beveridge Park on 22nd August raised £801 for the Christian Aids Pakistan Floods Appeal. Anyone interested in the formation of a Handbell Ringing Group please speak with John Methven or Ron Steedman. There will be a retiral offering for the Pakistan Floods Appeal at the end of the services on 5th and 12th September. We will be participating in Fife Council Doors Open Day on Sunday 12th September from 2pm to 5pm. You are welcome to come along and view pictures and also read about the history of our churches prior to the union. The Walkers next walk is on Sunday 29th August leaving the church at 12.40pm. We need to leave sharply by car to catch a no 13 bus from Mid Street to East Wemyss. This is quite a challenging walk in parts with steep steps (up!) and slopes downwards. Part of the walk is on the shore and over rocks so good shoes/ boots are advised. Approx 4.5 - 5 miles. All are welcome. The new season starts shortly for the organisations which meet in the Church halls. All welcome new members so please contact them if you'd like to take part. Guild meet every fortnight beginning Tuesday 14th September at 2pm. Country Dancing meet weekly beginning Tuesday 21st September at 7:30pm. Women's Group every fortnight beginning Tuesday 21st September at 7:30pm. Prayer Group meet monthly beginning Wednesday 15th September at 10am. Rainbows meet weekly beginning Wednesday 25th August at 5.45pm. Brownies meet weekly beginning Wednesday 25th August at 6:30pm. Guides meet weekly beginning Wednesday 18th August at 7pm. Mother & Toddlers meet weekly throughout the year on Thursday morning at 9:30am. Get Together meet weekly throughout the year on Thursday afternoon at 2pm. Senior Boys Brigade meet weekly beginning Thursday 2nd September at 7:30pm. Taekwondo Club meet weekly beginning Thursday 19th August at 5pm,Friday 20th August at 6pm & Sunday at 6:30pm depending on what level person is at. Church Choir meet weekly beginning Thursday 2nd September at 7:15pm. Dancing Classes (Ballet & Tap) meet weekly beginning Saturday 28th August at 10am. For this years Shoe Box Appeal we are using the Blythswood Care Shoe Box Appeal which gives a choice or gifts for adults as well as for children. By filling a shoe box you can bring hope and a smile to some of the worlds poorest people. Covered shoe boxes are available in the church vestibule or you may wish to cover your own shoe box. Information leaflets telling you about the appeal are also available. Please do not bring your filled box to church until a date has been given which is normally around the end of October. If you have any questions, please contact Angela Stewart. A range of improvements to the Manse will commence on Monday 23rd August. In total, six weeks of upgrading is planned with stabilisation work being required due to the impact of the unusually cold winter last year. The improvements will result in a refurbished house which will also be very economic to run. The Sunday School starts on Sunday 26th September. If you know of any child who would like to join us either on a regular basis, or just occasionally, they would be made most welcome. Please contact any of the leaders listed on the Sunday School page. The very popular African Children's Choir is performing in Kinghorn Parish Church on Sunday 22nd August at 7.30pm. Tickets are £5 and are available only from Ena Hudson on (01592) 890181. Entry is by ticket only (as requested by the Choir), and they are on sale now. A new Vacancy Information page has been created to provide details in support of our unrestricted call for a new Minister to lead Bennochy Parish Church. A parish/congregational profile document has also been produced which can be downloaded from the new page or viewed in printed form in the Prayer Room of the Church. The Walkers next walk is on Sunday 15th August leaving the church at 12.45pm heading for Cupar. The route is from Fluthers car park, through the town to Cuparmuir, over the Simpson Bridge and return to Cupar. 4.6 miles according to my pedometer. Coffee at Watt's or Cupar garden centre ( if the weather is not kind). The route can be very wet in patches so boots/stout walking shoes are advised. Sam and Janice McNaught have recently become grandparents! On Friday 23rd July, their daughter Carol gave birth to a little baby boy. Congratulations and Best Wishes from all at Bennochy Parish Church. There will be a sponsored walk round the Beveridge Park on Sunday 22nd August from 2pm to 5pm with all proceeds going to Christian Aid. You can walk as far or as short, as fast or as slow as you want and will always have someone beside you for company. Friends and family are also welcome to join in even if they do not want to be sponsored. Please meet at the main gate of the Beveridge Park at 2pm (by the Lions). Sponsor forms are available from Lilian Haig. St. John's had two Books of Remembrance and it is proposed to continue with this in Bennochy Parish Church - you can view the current book on the left side of the Church. A new book is to be purchased to include messages of thanks or remembrance. The message form with instructions may be found at the back of the new Book of Remembrance. On completion of the form, which should be accompanied by £10 cash or cheque, a draft copy of the message will be returned to you in order that any changes may be made. Upon approval, it will then be placed in the Book of Remembrance. The Walkers next walk is on Sunday 25th July leaving the church at 12.45pm heading for North Queensferry. We'll walk across the bridge, have coffee and sticky buns at the Brewer's Fayre, South Queensferry and return. Estimate 4 miles. Hoping for a calm, sunny day to soak up the beauty of Scotland at its best. All are welcome. Contact Dianne (890560) for more info. We now have two Church gardens (and Manse gardens) to keep tidy, and any extra help would be much appreciated. If anyone can help please check the notice board at the side door or speak to Roddy Sellars, Graeme Harrower, Angus Pryde or George Grant. Congratulations to Andrew Bease, who was presented with the Queen's Badge - the highest award available to a B.B. boy. He was presented at a special service in Dunfermline Abbey by the Lord Lieutenant of Fife on 6th June. The next newsletter will be issued in September. Any submissions should be handed in to the secretary by the end of August. Please use this to advertise any events that you are organising in the Church, or to post other information that would be of interest to the congregation. The next Walkers outing is on Sunday 4th July leaving the church as always at 12.45pm heading for Blairadam Forest, Kelty. This is really just a stretch of the legs ( 2.5 miles) this week so if you haven't walked with the group before and just want to try it out, this is an easy start. Stout footwear is advisable as the route might be muddy. All are welcome. KART's Summer Celebration will be held at Linktown Parish Church on Saturday 26th June from 10am to Noon. An opportunity to hear more about the exciting work talking place in our schools and community through Chris and Scripture Union. 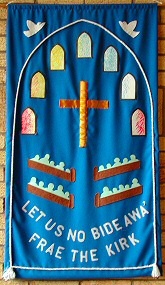 The North Primary School will be holding its End of Term Service in Bennochy Parish Church on Wednesday 30th June at 9.45am. All welcome. The Kirkcaly Branch of the Scottish Bible Society is holding a mini-fish-supper evening in Pathhead Parish Church on Friday 25th June at 7pm. Entertainment is by the Third Generation and the cost is £7. Please contact Sandra Marshall (262085) is you wish to attend - numbers are required for catering. The first in a new series of Bennochy Parish Church Newsletters is now available on the Newsletters Page. The next Walkers outing is on Sunday 13th June leaving the church at 12.45pm. This will be a circular 4 mile country walk starting from Ceres, picnicking at Hill of Tarvit Mansion House, Bridgend and back to Ceres for a wee visit to Griselda Hill. This is a challenging walk in parts and stout footwear is advisable. Phone 890560 for more info. Alzheimer's Scotland have arranged to use the Methven Hall on a monthly basis for about 1 hour commencing 14th June for a sing-a-long session called 'Musical Memories'. However, they do require one or more volunteers to play the piano for them. If anyone could help please speak to Bill or Ragnar. The Strawberry Teas will start on Friday 4th June and fortnightly thereafter until 13th August from 2pm to 4pm. If there are any ladies in the congregation who would be prepared to help on any of the Friday afternoons, please speak to Senga Booth or Grace Morrison. We would be delighted to hear from you. Kirkcaldy Christian Aid Committee has been given the dates of 2nd and 3rd June to have a collection at Tesco's with all proceeds going to Christian Aid. Collecting cans will be issued and our slot will be from 9am to Noon and 2pm to 5pm both days. You can do as much or as little as you want! Anyone interested please speak to Charlie Low or Angela Stewart so that a rota can be made. Thank you to everyone who attended, donated and helped at the recent Soup and Sweet Lunch. The wonderful sum of £482 was raised. Christian Aid has a vision - an end to poverty. Thank you for being part of it. Kirkcaldy Gilbert and Sullivan Society are holding their concert, "Musical Wanderings" in the Church on Friday 4th June at 7.30pm. Tickets priced £8, £7 and £5 (children) are available from Lia (01592 566353) or any member of the society. The Christian Aid book sale has been held at St. Andrew's and St. George's West Church, George Street, Edinburgh for the last 36 years and raised £1.8 million for Christian Aid. Opening hours are Monday 10th May - Friday 14th May from 10am to 3.30pm with late opening until 7pm on the Thursday. The Walkers are heading for Culross on Sunday 23rd May for a short 2.5 mile walk around the historic town, abbey and church. If the weather is kind we also hope to have a Pentecost Picnic in Pittencrieff Park. We will car-share as usual, or take a minibus if there are more than 12 walkers. Phone Dianne 890560 for more info. All are welcome. An open informal meeting has been arranged to welcome our Mission Partner, Jenny Featherstone, while home on furlough, from Kitwe, Zambia. This may include other Church members from Kirkcaldy Presbytery who missed the occasion to host her in their own Church. Do come and meet with Jenny on this date for Bennochy Church! - All welcome on Friday 7th May at 2pm in the Methven Hall. You can listen to one of Jenny's other talks, in Aberdeen, by visiting the Newhills Church site. The Kinghorn Singers present their Christian Aid Charity Concert in St. Bryce Kirk Centre on Friday 14th May at 7pm. Tickets are £7 and are available from members or at the door. To commence Christian Aid Week there will be a "Soup and Sweet Lunch" in the Methven Hall after the service on Sunday 9th May. Please come along and enjoy the company, chat and of course the food! Anyone willing to help with the preparation of food or serve at the tables will be made most welcome. Please speak to Angela Stewart. For practical reasons the number of tickets are being restricted this time - so please get your ticket as soon as possible. Tickets £4 available now with all proceeds going to Christian Aid. The local action group of the Scottish Bible Society hold their annual Songs of Praise on Sunday 20th April at 6.30pm in Torbain Church. The Praise Band of St. Ninians Church, Glenrothes is participating. There will be a Quiz Night for the Maggie's Centre on Monday 17th May at 7.30pm in Dunnikier Park Golf Club. Tickets priced £2.50 can be purchased at the Maggie's Centre or from June Waddell (tel. 264155). Monday (19th April), Wednesday and Friday between 10am and 11am. Sunday (25th April) between 10am and 10.45am. The next Walkers outing takes place on April 25th leaving the church at 1.00pm, a little later than usual. We're off to Aberdour this time on a lovely 4 mile walk beginning at the car park at Hawkcraig Road and ending in the tea room at Aberdour castle where the scones are magnificent. We'll car-share as usual. All are welcome. Do you have any old spectacles lying in a drawer? If so, you could be helping millions of people in the developing world who simply need spectacles to lead a normal life. Vision Aid Overseas is a charity who send teams of volunteer professional Optometrists and Dispensing Opticians who carry out eye tests and provide spectacles appropriate to the patients needs. A box is in the vestibule and all old spectacles will be gratefully received. On Sunday 25th April members of the congregation will be requested to remain in the Church for the purpose of electing representatives to serve on the Congregational Board of Bennochy Parish Church. The Guild invites everyone to a Coffee Morning on Saturday 17th April from 10am to Noon in the Methven Hall. Please come along to support the work of the Guild. The congregation will soon be asked to elect members to a committee whose job will be to find and nominate a minister for our Church. Only those people on the Communion Roll are able to participate in this election so the register is now being prepared by the Kirk Session. The register comprises those who are on the Communion Roll and also those who, being at least 18 years old, have applied in writing to the Kirk Session to have there names added as Adherents. If you are not on the Communion Roll but you are a regular attendee and wish to be included in the Electoral Register, there is an application form available. Please submit this to either Bill Stenhouse or Ragnar Ingebrigtsen at the earliest opportunity. Please note that if you are on the Communion Roll of another Church at present, then you would have to obtain a Certificate of Transfer to qualify for this Electoral Register. This year, Christian Aid week runs from 9th to 15th May 2010. Angela Stewart will assume that those who helped with the Christian Aid envelopes last year will so do again this year unless she hears to the contrary. If you have a few hours to spare for a very worthwhile cause then please join the team of collectors as illness, holidays etc. sometimes leaves a shortage of collectors who distribute and then collect the envelopes within the parish. Anyone (male or female) who would like to help with tea and coffee after the Church on Sundays and does not already do so, please see Jane Drummond or Margot Stenhouse. The flower list for the rest of the year is at the front door and there are still 8 blank Sundays. If you would like to provide flowers for the Sanctuary, please add your name to the appropriate Sunday. Holy Week Service - A special service on Tuesday 30th March at 7pm as part of the Town Centre Churches Holy Week services led by Rev. Ken Froude. Volunteers are requested to decorate the Church for Easter. Please meet at 6.30pm on Thursday 1st April. Walk up Falkland Hill on Easter Sunday, leaving the Church at 7.30am. Only 8 places left on the bus. Contact the Walkers for details. Easter Sunday Service at 11am - Please bring a daffodil to decorate the cross! Jenny Featherstone, our Missionary Partner in Zambia, is visiting Kirkcaldy Presbytery from 1st to 10th May. We have the opportunity of meeting with her either by invitation here or by attending other Church events. We have to notify the World Mission Convener of our intentions by 31st March. So, if any group/person is interested in having a visit from Jenny, then please let Sandra Marshall know so that we can send the form as soon as possible. There are two Sundays within the visit period and these options will be explored. Volunteers are required to assist with distribution of monthly newsletters in the future. Please contact Ragnar Ingebrigtson or Bill Stenhouse for further details. Come and join the new Bennochy Walkers on a canny climb up Falkland Hill on Easter morning for a short time of celebration and praise. Minibus will leave the Church at 07.30am and return in time for bacon butties before Church. The current St. John's web address will no longer bring you to these pages so please visit and bookmark the new web site after this date. It's nearly time for the Get-Together annual Tea Afternoon. This year our chosen charity is the National Deaf Children's Society. Come and join us on Thursday 25th March at 2pm. Usual terms with £1 minimum please! In Ipusukilo - Now with a shelter for their meetings, especially in the rainy season. In Kamatipa - Working on a "play for all" project. Please pray for those mourning or affected by cholera and for the right leader for the "play for all" project. She also gives thanks for the land allocated by the Rural District Council for this projaect and for our support in all past activities. The Women's Group are having a Table Top Sale on Tuesday 23rd March at 6.30pm. Goods for sale can be handed into the Methven Hall on 17th March from 2-4pm. The sale is open to any group, £6 to rent a table. Please speak to Irene Wood (267995) or any member of the Women's Group. Now is the time to have a good clear out. West End Congregational Church at 2pm. Torbain Church and E.U. Congregational Church at 7pm. You are welcome at these services which this year have been compiled by the women of Cameroon. The Kirk Session has decided that the opportunity to contribute to the Helping Haiti Appeal will be made available at the close of worship on Sundays 7th and 14th March. Souper Sunday Lunch - £447.60 for Church of Scotland HIV/AIDS Projects. RNLI SOS - £765 from the tea afternoon. The next Walking Group event will take place on Sunday March 7th. Cars will leave the church at 12.45pm heading for the Retail Park where we will leave the cars and take the bus (13.16pm) to Cardenden. The walk will go from Dundonald Den to the Begg Farm, ending up at Home Farm View for coffee. Remember to bring along your suggestions for the new name for our walking group. Fairtrade Fortnight will be held from Monday 22nd February to Sunday 7th March this year. Millions of farmers across the world struggle to feed their families and yet they supply us with everyday items which we enjoy. Fairtrade has given which one worker calls "sustainability of life" - security for the future, funds to invest in education, health and economic development and has "opened the vista for a sense of belonging and self-development". But for their dreams to become a reality we need to ensure that more people buy Fairtrade products more often. So start swapping your usual bananas for Fairtrade bananas, your usual cuppa for a Fairtrade cuppa and look for the Fairtrade sign while shopping. Each any every swap proves that people of the UK want producers in the developing world to get a fairer deal. There will be a Fairtrade Stall in the Church vestibule on 7th March where you will have the opportunity to purchase Fairtrade goods. You can read more about Fairtrade by clicking here. The Prayer Group will meet for an hour on Wednesday morning, 17th February, at 10am in the home of Mrs Janet Ferguson, 16 Montgomery St, Kirkcaldy. All are invited to join them. The Service of Union, joining the congregations of St. John's and St. Andrews as Bennochy Parish Church of Scotland will be held on Tuesday 16th March at 7pm. In attendance will be Rev. Ken Froude and the service will be led by Rev. Wilma Cairns. From this date, the interim moderator for Bennochy Parish Church of Scotland will be Rev. Catriona Morrison from Linktown Parish Church. Our thanks to Rev. Alex Forsyth for his time as interim moderator of St. Johns. A special Tea Afternoon serving Sponges or Scones will be held in the Methven Hall from 2pm to 4pm on 26th February in support of the Royal National Lifeboat Institution SOS Day. There will also be a Cake and Candy stall. Tickets are on sale now priced at £2.50 from Senga or pay at the door. The total collected in the gift boxes for the year 2009 was £593.37. Please make your coppers turn into pounds by filling a yellow gift box. The boxes are available in the Church vestibule. Girlguiding UK is celebrating its centenary during 2010 and to celebrate there is a special exhibition at Kirkcaldy Museum called "Girls in the Lead" which will run from 24th April to 30th May and focus on the organisation in Fife. Royal Mail have also produced special stamps and there is a Girlguiding UK Centenary web site you can visit. The panel of arbiters appointed by The Church of Scotland have selected the buildings of St. John's Parish Church as the sole place of worship for the new Bennochy Parish Church of Scotland. The decision was announced at a special meeting held at St. Bryce Kirk on the evening of 27th January 2010. Further details on special services to be held on completion of the Union between St. Andrew's and St. John's will be provided at a later date. For many of you who read The Courier newspaper, you perhaps saw an article from the Fife organisers of Operation Christmas Child saying "the response to the appeal was outstanding". The Arbitration process will be completed on Wednesday, 27th January when the Church building to be retained as the sole place of worship for Bennochy Parish Church of Scotland is likely to be named. A copy of the schedule for the day is on the Church notice boards. At 7pm there will be a meeting of Arbiters and Congregations in St. Bryce Kirk Centre. Sunday 31st January will be Homelessness Sunday. The Worship Committee will lead the service. Guild meeting for 11th Jan is cancelled. Get-Together is cancelled for the 14th. The Souper Sunday has been moved to 21st February. The next Walking Group walk will take place on 17th January leaving from the church on foot at 12.30pm. As the weather is unreliable, it's safer to stay near to home this month so we'll walk to the Beveridge Park and around it as far as Southerton Cres, through the woods, past Raith Lake and back to the church. Just over 4 miles. All are welcome. Bring a piece of local knowledge for all to share please. As part of the process to complete the Union between St. John's and St. Andrews Church's, submissions can be made in writing to the arbitrators from any member of the congregation or associated organisation. If you wish to make a submission please contact Bill Stenhouse who will provide the address and any further information. Submissions must be made by the 15th January. To raise funds for Kirkcaldy Presbytery's contribution to the Church of Scotland's HIV/AIDS project we will be holding a Soup and Sweet Lunch on Sunday 10th January. Tickets are priced £4. The flower list for 2010 is now in the vestibule of the church. If you wish to provide flowers for the Sanctuary, please add your name to the appropriate Sunday.